Kalmar Village is a family resort of authentically styled Cape Cod cottages, efficiency units and motel rooms at the shore of beautiful Cape Cod Bay. 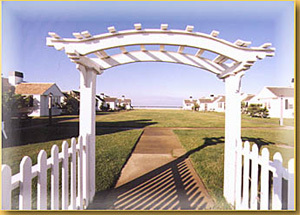 Much of the village is grouped around lush green landscaped lawns which give way to a private sandy beach on the southerly side and breathtaking views of the National Seashore sand dunes to the north. The well-kept accomodations combine many of the conveniences of home with the luxury and comfort of a resort. The cottages and efficiencies have modern kitchens and are fully equipped for cooking and dining.